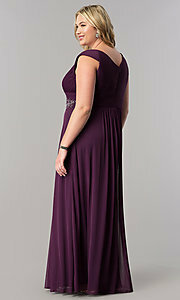 Also ideal as a mother-of-the-groom dress, this eggplant purple plus-size mother-of-the-bride dress features a surplice v-neck bodice with stylish pleats and fashionable cap sleeves. An intricate pattern of sparkling rhinestones adorns the empire waistline of the long chiffon evening dress, while the long a-line skirt boasts additional pleats that flatter the figure. This long eggplant purple chiffon formal mother-of-the-bride dress under $200 dress offers a romantic style choice for family celebrations and other formal events.